Despite the fact that I sat on Think for longer than I intended (Jonathan beat me to it) I found it worth the wait. I had to confess I was drawn to the title because I think people fail to do just this with their Christian faith. As a society we've grown complacent. We look at books about theology and we think they are too hard for us to read. We look at old hymns of the faith and consider them outdated and too difficult to sing. We run into someone who thinks differently than ourselves and we're sometimes too afraid to just stand up and say, "I disagree." Words as simple as that won't fall from our lips because we are afraid of the consequences. (And it's true. Tell someone you don't agree with them and hold fast to your convictions and you will be judged and attacked for it, if not simply thought poorly of.) All the more reason for us to learn how to think properly, so that we will be ready to give an answer when it is needed. Then I opened the book and Piper gave me perspective. Oh yes, this is a book about thinking, to be sure. It is a book about learning to think Biblically, accurately and in a God-oriented way. The basic message Piper is communicating in this book is that thinking's primary purpose is to drive us into passionate worship of God. It is to know Him more fully, to learn to serve Him with all of your heart, soul, and mind. In other words, to be able to worship passionately, we must learn to love wisdom and knowledge. To learn is to grow in a myriad of situations but specifically to know the Lord. 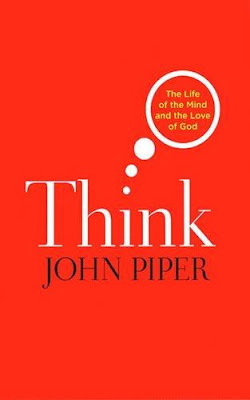 I think perhaps the chapter I enjoyed the most in this book was Piper's chapter on The Immorality of Relativism (Chapter 8) and helped me to understand what the arguments of Relativism is as well as how to think about it. I could write up an entire post just on the one chapter! Think is very approachable book. Piper's writing style is easy to read and follow along with. It's hard to miss the points he is trying to make and his arguments are worth a listen. Obviously, I liked it. I appreciated his emphasis on learning to love God and others. I appreciated the way he concluded the book by stressing the importance of non-thinkers relying on thinkers, and thinkers to admit and confess their ultimate dependence on God and to not shut out all emotions. I thought Think was well-balanced in both its approach to thought and its encouragement of it. I highly recommend it. Sounds good. I suppose the only weakness of books that remind us of the importance of thinking is that it's generally those who already think who read them. But maybe there is power in a name -- maybe there are people who would read John Piper who wouldn't read other authors saying the same thing. Enjoyed getting your thoughts on this one! Seriously -- looks like one I should put on my list. Bumping this one up on my wish list so I can read it. After reading your review, I see how much I really, really need this book right now. I'm not a huge John Piper fan, but this book I'm very interested in. Thanks for bringing it to my attention! I can not recall if I read Piper before but this one sounds worth trying. Thanks for sharing about it. Awesome review...as expected! I hope I can find this on on audio-book, sounds like it'd be the perfect travel companion on my way to and from work! I'm gonna have to read this one some day here. Last year was my year of "exercising my mind towards the things of God"--and I definitely learned that moving the mind can move the heart towards worship. I'm HIGHLY in favor of the integrated form of worship that engages both mind and emotion. After all, are we not called to love God with all our heart, soul, mind, and strength?